Some years ago one of my husband’s aunts passed away. She was artistic, bubbly, and a favorite of mine. I had always enjoyed visiting with her at reunions. I made it a point to talk about her with her husband when I saw him at the reunion the next summer. He told me that she had left some unfinished doll clothes that she had planned to make for their granddaughter. I offered to finish the doll clothes. He thanked me, but I didn’t hear anything more about it for over a year. Then one day a delivery man left three huge boxes on our porch. The boxes were full of craft projects, mostly cut out clothes for American Girl and Magic Attic dolls. I had not realized that I had volunteered for such a large undertaking, but I was a good person to choose to finish this project. I had most of the doll clothes patterns that she had used. Some of her patterns and their guides had been misplaced, but I was usually able to find the information that I needed to finish the outfits from my own patterns. I could not finish everything in the boxes, because I have an allergy to wool and I had to give some lovely wool pieces away. I made and dressed three dolls for my young cousin: one American Girl size, one Magic Attic size, and one the size of my Florabunda doll. I made the small doll to use up the scraps. It took me three years to finish all the dolls and their clothing. Since we have a reunion every year, I brought a doll along me to give her each of those three years. 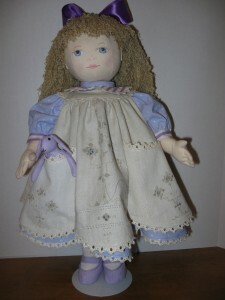 The “reunion doll” almost became a tradition. My young cousin is now in high school. I sat by her at our last reunion dinner and she told me that she still has her dolls and still displays them. Here is a doll I made for my sister-in-law using a “reunion doll” pattern that I drafted to wear American Girl doll size clothes. My Kitty doll pattern is related to this pattern, but I have made a lot of changes in the original pattern. I think that Kitty is easier to sew. If you happen to try to look at my website this Tuesday (October 2), and it has disappeared, don’t be alarmed. My web service is changing servers and the site may be down for a little while. It should be back on line in a few hours. A few weeks ago my husband and I attended an annual family reunion. These reunions are always fun. I love all the visiting and catching up with everyone’s life, but I tend to fidget unless I have something to do with my hands. I usually take an embroidery project to work on while I’m talking. 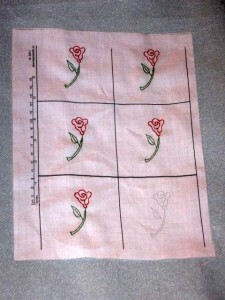 I had received Doodle Stitching by Aimee Ray for Christmas and selected a rose motif from the book to embroider. The motif is very dainty. 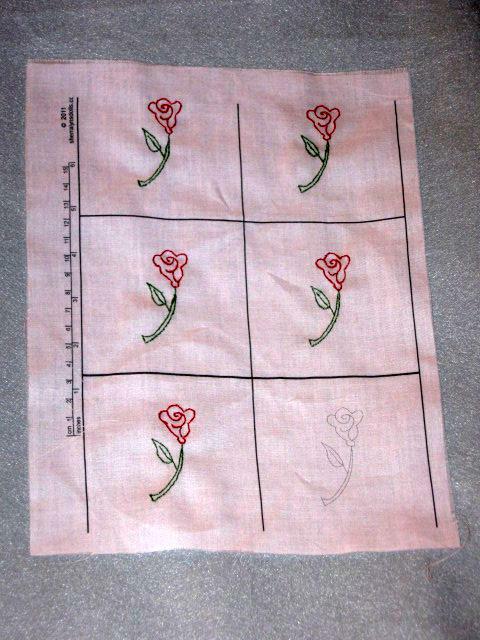 With help from technical support (husband) I made several copies of the rose on a fabric sheet. We divided the designs into quilt blocks. I hope to put the completed blocks into yet another miniature quilt. Such a small design needs only a single strand of embroidery thread and the smallest size crewel needle, a number 10 crewel needle, to make the small stitches. I don’t always use a needle threader, but I use one when I need a number 10 needle. I carefully packed up my fancy work before we left. I remembered everything I needed, including my needle threader. I have the traditional type of threader with a piece of light metal holding a thin bent wire to use for threading. I didn’t expect the tiny needle eye to pull the wire out of its holder the second time I tried to use the threader. I couldn’t easily replace my broken tool. Many times a hotel can provide unprepared travelers with a tooth brush or sewing kit, but the sewing kit’s needles come prethreaded. It does not contain a needle threader. I guess that needle threaders are old-fashioned. For the rest of the weekend I had to thread my needle without any help. I managed to thread it every time, but I didn’t get as much embroidery done as I had planned, because so much time was taken up threading needles. I’m looking for sturdier needle threaders, but haven’t found any that work well yet. The moral of my story is: If you are traveling with a needle threader, travel with several. I will show you my miniature rose quilt when I have completed it. Here are the blocks that I have embroidered so far. 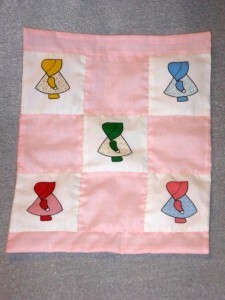 Coming next week: A free download of the miniature Dutch Doll quilt blocks featured in my June nineteenth blog. Coming in August: A chance to win the PDF of your choice from my pattern selections. I have shown you two of my grandmother’s quilts that I cherish. 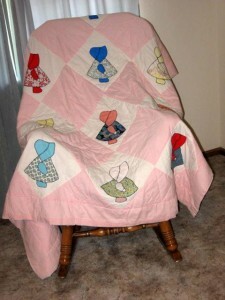 Today I am going to show you my third quilt. My grandmother called this a Dutch Doll quilt. I think a more popular name is Sunbonnet Sue. My grandmother’s quilt is a rather simple version of this design. I have seen several elaborate variations. 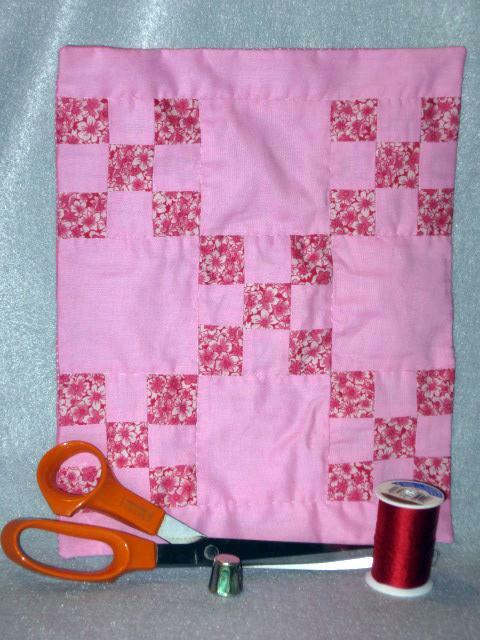 My technical support has helped me to come up with a miniature version of my grandmother’s Dutch Doll quilt. We made six quilt blocks of the tiny Dutch Doll and printed them on a sheet of Dritz’s Printed Treasures printable fabric. 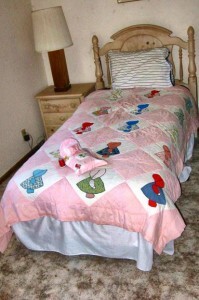 I substituted the Dutch Doll blocks for the nine-patch blocks in my quilt instructions for my doll bed pattern. 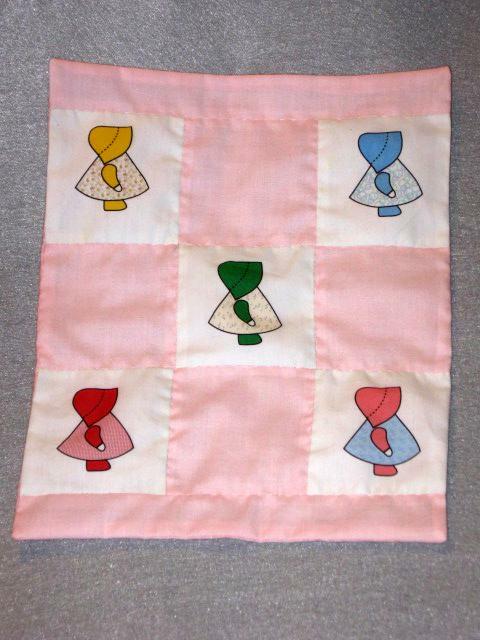 The quilt used five of my six Dutch Doll blocks. I appliqued the sixth doll on a decorative pillow. Here are the two quilts for a size comparison. This past week I finish revising my Princess Irene pattern. The pattern was first published in Soft Dolls and Animals in 2009. The pattern for the fifteen inch doll is now available for purchase and download at my pattern store. To get to the store, visit my pattern page, find the pattern you like, and click the “Buy Now” button. Once you are in the store, you can decide if you would like to make a purchase or not. Princess Irene is the princess in George McDonald’s book The Princess and the Goblin. I was fascinated by Irene’s dress in the original illustrations by Arthur Hughes. He drew Irene wearing a peasant dress with an elaborate leafy design on the skirt. I decided to simplify the skirt design and work it in shadow embroidery. I added a bow to the design, because it is used so often in shadow work motifs. I gave Irene beads, because she is wearing them in the illustrations. The ring with the red stone is described in the story. I am sentimental about this doll for several reasons. The pattern was the first thing that I ever had published. I have posted before that I did the embroidery work for the skirt while I was sitting with my dear father-in-law. Also, my grandmother’s name was Irene, and I think that she would have enjoyed seeing this doll with her name. You can find more information about the pattern on my pattern page, below the patterns for small dolls. 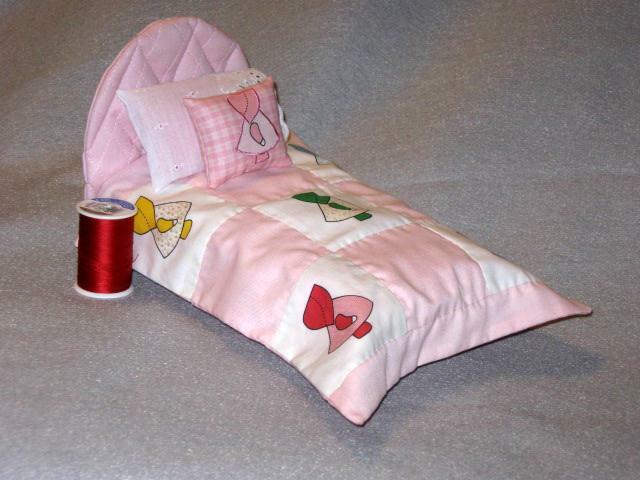 My newest pattern is a doll bed for dolls nine inches and smaller. The Bonus Sheet gives instructions for a nine-patch quilt. Last month I blogged about some of my grandmother’s quilts and my attempt to use use the nine-patch design in a doll quilt. I have finally come up with a design that I like. Of course I used the same size patches as those in my grandmother’s quilt. The patches from my grandmother’s nine-patch quilt scaled to doll size would be impossibly small. I think that the charming size of the original patches are just fine for a small doll quilt. The quilt is machine pieced and hand quilted. The quilt top is lined, but I did not add a binding trim around the edge. Please select the patterns button at the top of the page. Scroll down until you see the doll bed pattern. It is between the shoe pattern and the three small dolls pattern. Click on the pattern image to see a picture of the quilt on the bed. When I started to high school, I took a class in sewing. One of my classmates was an upperclassman who was also a twirler in our marching band. Modern marching bands seem to have color guards instead of twirlers. Our band had four twirlers who marched in front of the band and did interesting things with their twirling batons. The twirlers also got to wear very attractive short costumes instead of the clunky band uniforms that the rest of us had to wear. The twirler in my sewing class was a very nice person, but I was new to high school and band. I was in awe of her. When she gave the class a sewing tip, I took her seriously. She suggested using a contrasting thread when hand basting a seam, before sewing it on the machine. She thought that the basting thread was easy to remove after the seam had been sewn, because the contrast made it easier to see. I took her tip as a royal command. I used her basting method for years. Then I realized that sometimes I caught the basting thread with my machine stitches. When this situation occurred, the caught thread was very difficult to remove. If I didn’t spend a lot of time with tweezers removing the thread, it was a visible mistake. The contrasting thread color showed up very well. Sometimes hand basting stitches in the tiny doll clothes don’t need to be removed at all, if the thread color matches. Now I use matching thread when I baste doll clothes. However, if you think the contrasting thread trick is a better method of basting, please use it. When my daughter was about three years old, she developed an affection for my glass head silk pins. She also had a fondness for my tomato pin cushion, but that is another story. She called the pins “sticky pins.” I think that the name came from the constant warnings that she was given not to stick her finger. I let her play with the pins when I was around to watch her, although I worried that I was a bad mother for letting her play with something that could hurt her. 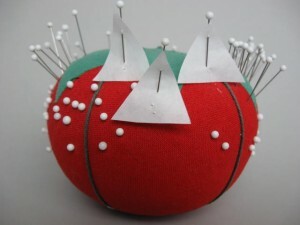 For her the pins were little people that had adventures as she took them out of the pin cushion and then replaced them. I have written about learning to sew from my grandmother. Unfortunately we were not able to continue this tradition with my daughter. My own mother passed away before my children were born and my mother-in-law never lived close enough to give consistent lessons. My daughter did have at least one sewing adventure with her grandmother, however. My mother-in-law stayed with my daughter and her older brother, when my youngest child was born. 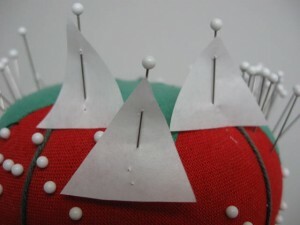 Weeks later, when I had time to look at my sewing things, I noticed little triangles pinned to many of my pins. I ask my daughter about them and found out that Grandmother had made dresses for some of my sticky pins. This is their close up shot. I learned to sew before I learned to write. My mother never thought that I held my pencil correctly, but she approved of the way I used a needle. I still sew the way I was taught by my grandmother and use a thimble on the middle finger of my right hand. I have been surprised to learn that some very good seamstresses don’t bother with a thimble. At this point in my life, I don’t think that I could manage without one. My mother-in-law gave me these lovely thimbles when her poor vision made it impossible for her to continue sewing. 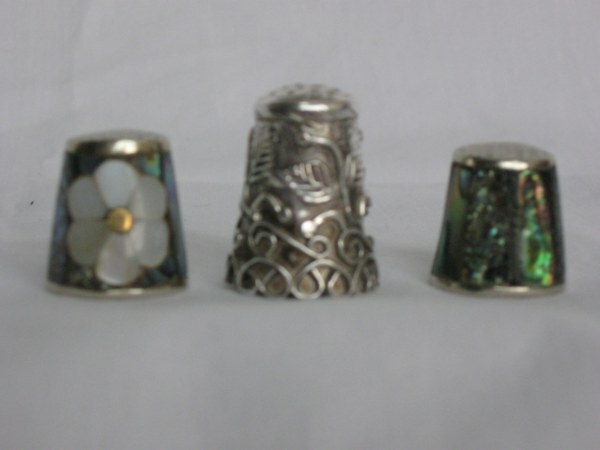 The two smaller thimbles are inlaid with mother-of-pearl. The larger one is sterling silver. I use them all the time. I think of them as sewing jewelry. 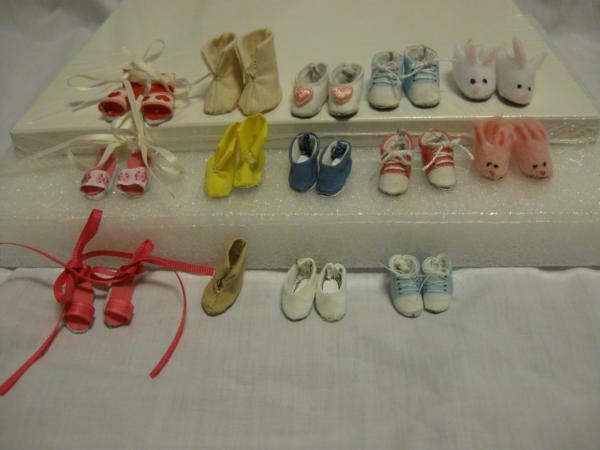 I have always thought that tiny shoes were charming. The dolls that have survived my childhood still have their original outfits and hair styles, but they are all barefoot, because I tended to play with their shoes while they sat on the shelf. I have spent a lot of time recently designing and making shoes for the three small dolls shown in a recent blog. The sneakers’ designs were printed on cloth using techniques I explained recently.I then cut out and assembled them. I haven’t yet made bunny slippers for Twinkle, my smallest doll. To prove that I haven’t changed much from my younger self, I have lost one of Twinkle’s boots. Is anyone else besides John Nickolaus interested in winning a copy of my book? If you make a comment on any of my blog posts, you will be eligible for the drawing on March 2. There are suppose to be two winners, but so far, it looks like John will be stuck with two books, if someone else doesn’t make a comment in the next three weeks. John collects Oz memorabilia, so I am going to explain a little about the Dorothy in my pattern book. The Wonderful Wizard of Oz was one of my favorite books as a child. (I still love it.) I loved the movie, but I loved the book more. Sometimes in our culture after a movie is made from a popular book, the movie defines the story, rather than the book. It may not matter much that in the original story Dorothy wore silver rather than ruby slippers, but I wanted to make a doll with silver slippers. The dresses I made for Dorothy were inspired by the original book illustrations. When I wanted to design a larger wardrobe, I began to realize how much the movie had influenced me. The first Oz book was illustrated by W. W. Denslow. In Denslow’s illustrations Dorothy has braids. I was certain that she had black braids like Judy Garland. The rest of the original books were illustrated by John R. Neill. In his illustrations Dorothy has short blond hair. I designed Dorothy some clothes using the later books as models, but I can never imagine Dorothy with anything, but a braided hair style. I tried to bring something from the books to my Dorothy doll, but I have to admit that I am also influenced by the movie.